Assumption: Plant inspection and sampling are conducted in lieu of destination sampling. Plant inspection is conducted when it is reasonable to visit the plant on a periodic basis. 1. To determine the responsibility that your district has for sampling PAL suppliers, refer to the Cognos 8 “District PAL Producer Responsibility” report. This report lists the responsibility of each district. Note: The report in step two below automatically shows only the plants your district is responsible for inspecting. 2. To determine whether or not a plant inspection is necessary, refer to the Cognos 8 “Facility Review Summary” report. This report lists the activity associated with the PAL supplier. A plant inspection is appropriate if any activity has occurred during the last month. As a general practice, one sample would be required for every 10 shipments. In instances where the quality of material is suspect or the producer is new, reference the Engineering Policy Guide (EPG) Category 106.12 to determine the quantity of samples necessary. All material subject to one sample ID is one shipment. 3. Select a specific Sample ID from a PAL shipment from the last month to be used to confirm the plant’s PAL documentation process is satisfactory. 4. A variety of reports are available in Cognos 8 to answer various PAL related questions. Feel free to use any reports that are beneficial. 1. 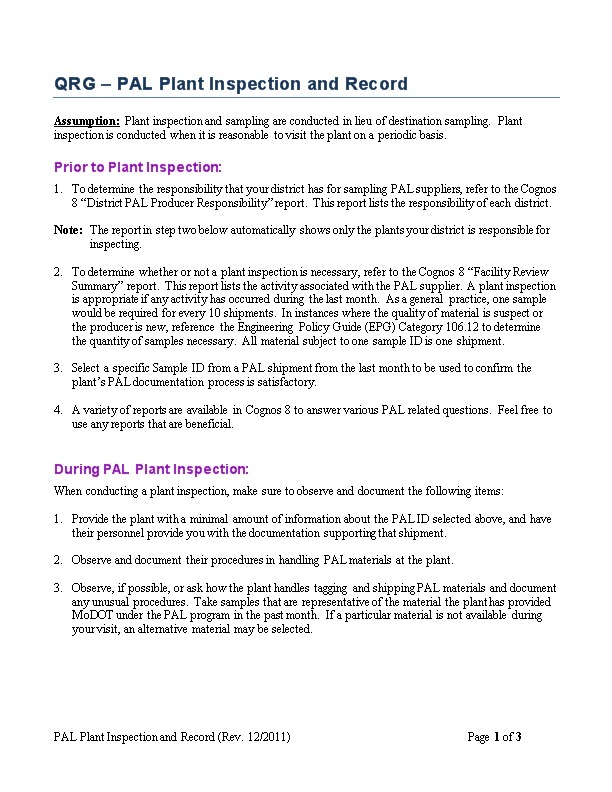 Provide the plant with a minimal amount of information about the PAL ID selected above, and have their personnel provide you with the documentation supporting that shipment. 2. Observe and document their procedures in handling PAL materials at the plant. 3. Observe, if possible, or ask how the plant handles tagging and shipping PAL materials and document any unusual procedures. Take samples that are representative of the material the plant has provided MoDOT under the PAL program in the past month. If a particular material is not available during your visit, an alternative material may be selected. Note: Separate sample records are required for any samples taken. The plant visit record must be entered in the system first. Use the “Link To” field to tie each sample taken to the plant visit. This field should contain the Smpl ID of the plant visit record. 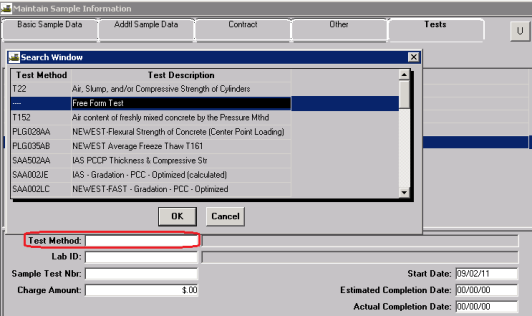 Complete the Basic Sample Data tab and save the data. Complete the remaining information and Save. Select Services - Enter/ View Test Data. Enter any observations made while visiting the plant, as well as noting any samples that were taken. 1. The level of cooperation encountered at the plant. 2. A description of the internal quality control program at the plant. 3. The packaging, tagging (when tagging is necessary), and handling of products at the plant. 4. The level of organization in regard to documentation. 5. The plant’s procedure for handling and identifying any material that fails the quality control process. 6. Any unusual practices noted during the inspection.